« Live with it! There’ll always be movie sequels. Good thing, too. We’re just beginning to understand the history of film forms, but some trends in Hollywood already seem clear. During the late 1910s American filmmakers synthesized an approach to cinematic storytelling that relied on continuity editing, the practice of breaking a scene into matched shots in order to highlight character action and reaction. In the years that followed, this editing strategy became the dominant approach to mass-market filmmaking across the world. Many historians and theorists believed that editing was the essence of cinema itself. When sound arrived in the late 1920s, the technology was difficult to master and consumed a lot of production time. It would have been easy for American filmmakers to shoot every scene from a single position, but instead they used multiple cameras to cover the action, much as three-camera TV handles sitcoms now. This made filming cumbersome and limited the lighting choices, but filmmakers wanted to preserve the option of cutting to closer views and fresh angles as the scene developed. Continuity editing continued through the 1930s and well beyond, with filmmakers refining it in various ways. The strategy has proven remarkably robust. Today’s mass-audience films, from all over the world, adhere to the principles and particulars of continuity editing. Not many artistic styles, in any medium, have had such a long run. These ideas are developed in more detail in things that Kristin and I have written. (1) Most recently my book The Way Hollywood Tells It tries to track shorter-term changes in the continuity style. I found that one handy way to do this was to look at remakes. Remakes allow us to keep story factors somewhat constant and focus on differences in visual technique. Today’s blog looks at parallel scenes from two films, an original and a remake, in order to illustrate what I’ve called “intensified continuity”—the editing style that comes to dominate American films after 1960 or thereabouts. 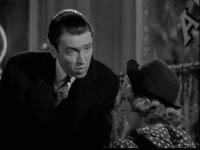 In Ernst Lubitsch’s wonderful Shop around the Corner (1940) Kralik (James Stewart) works in a Budapest gift shop with Klara (Margaret Sullivan). They quarrel constantly. But each has an anonymous pen pal, and the relationship is growing into love. Unfortunately, we learn early on, they’re writing to each other. On the day they’ve agreed to meet face to face, Kralik is fired. 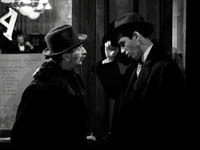 He and another salesman Pirovitch (Felix Bressart) trudge to the café where Kralik is to meet his secret friend. Kralik can’t bear to face her now that he has no job, so he wants Pirovitch to deliver a note saying he can’t come. Still, his curiosity makes him ask Pirovitch to look in the window and describe her. Pirovitch tries to soften the blow, but he has to admit that the young woman waiting with a copy of Anna Karenina and a red carnation is Klara. Angry, Kralik takes back the note and decides to let her wait. But after Pirovitch is gone, he returns to the café and meets her—not divulging his identity, but trying some conciliatory moves. In the silent era, Lubitsch was one of the greatest exponents of continuity editing. You need only look at The Marriage Circle or Lady Windermere’s Fan to see his quiet virtuosity. (Kristin’s Herr Lubitsch Goes to Hollywood devotes a chapter to his cutting.) 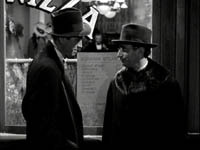 But in Shop around the Corner Lubitsch uses only two shots to present Kralik’s and Pirovitch’s conversation outside the café. 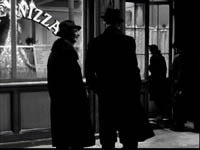 A fairly distant tracking shot follows the two men to the window, then we get a very lengthy shot of the two men outside. It starts with Kralik instructing Pirovitch to check on what his correspondent looks like. Another director would have given us point-of-view shots showing what Pirovitch sees, along with his reactions. Instead, Lubitsch keeps the emphasis on Kralik, who’s responding to Pirovitch’s reports. Consequently, Kralik’s reactions aren’t given in cut-in close-ups but rather in the prolonged two shot. This allows both performers to act with their bodies. Bessart’s shoulders relax, for instance, when he spots Klara, as if he’s slightly recoiling. Stewart’s reactions are more varied; he leans forward eagerly and nods as Pirovitch finds the woman. He slumps, then tugs his hat when Pirovitch mentions Klara. Kralik looks in to see for himself, and collapses a bit. He eventually relaxes when he wryly accepts the fact that his pen pal is his quarrelsome coworker. Visually, it’s a simple scene, but it shows the power of the unvarnished two-shot. 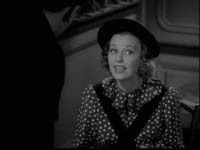 After the two men separate, Lubitsch shifts the scene inside and gives us another sustained shot as the anxious Klara talks with a waiter. Instead of crosscutting to Kralik returning outside, Lubitsch creates a humorous shot by letting his head drift into the window behind Klara. When Kralik goes in to meet Klara, he doesn’t tell her that he’s her pen pal, so narrationally speaking, the knowledge is unbalanced. He and we know more than Klara does, which makes her unhappiness more pathetic. It’s a wonderfully textured scene, partly because we know that each one’s annoyance with the other masks disappointment and anxiety. 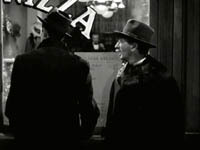 As the action develops, there’s somewhat more cutting, but even Lubitsch’s closer views often keep both in the frame. He saves his closest shots for the most intense exchange, when Klara mockingly refuses Kralik’s efforts at friendship. The scene will end on a painful note, with each wounding the other with hurtful remarks. As you probably know, The Shop around the Corner was remade as You’ve Got Mail. There are some important story differences. The two protagonists have other partners, and Joe Fox owns a bookstore chain that is crushing the children’s bookstore owned by Kathleen Kelly (Meg Ryan). But the parallel scene in You’ve Got Mail is remarkably similar to the one we’ve just been examining. The sequence starts with Joe and his assistant Kevin (Dave Chappelle) approaching the coffee shop, and Joe is apprehensive—not because like Kralik he’s out of a job but because of the upheaval that meeting his email correspondent could cause in his personal life. Like Kralik, he asks his friend to peer in the window to check her out. But Nora Ephron handles the scene quite differently than Lubitsch did. She breaks all the dialogue into several shots, mostly favoring one actor (either over-the-shoulder shots or what are called singles). The process starts during the men’s approach to the café. Once they arrive, the staging stations Joe at the foot of a flight of stairs and Kevin at the top, so a sustained two-shot isn’t really in the cards. The pattern is that Kevin reports what he sees, and in reaction shots we see Joe’s response. 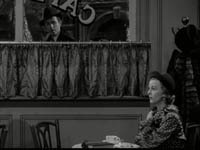 When each man looks inside, unlike Lubitsch Ephron supplies point-of-view shots of Kathleen. Joe reacts vindictively when he learns his email correspondent is his adversary, and he returns to punish her, but not before we’re taken inside the café and watch Kathleen wait for her correspondent. Even her encounter with another customer, somewhat similar to Klara’s chat with the waiter, is broken into three shots. 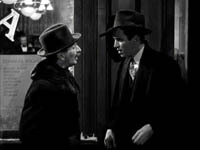 When Joe arrives, his conversation with Kathleen is handled in variations of shot-reverse shot, often in fairly tight framings. Again, the closer framings accentuate the bitter insults the characters exchange. Both scenes run almost exactly the same length: 8:48 in Shop, 8:42 in You’ve Got. 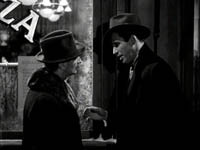 But the initial portion, showing the two men on the sidewalk, consumes only two shots in the Lubitsch and 41 shots in the Ephron. That means that Lubitsch’s average shot in the scene runs about 82 seconds, while Ephron’s runs about 4.1 seconds! The same disparity arises in the section of the scene taking place in the café. In Shop, 14 shots treat the action inside, but in You’ve Got there are 84! Lubitsch’s shots in this portion average about 21 seconds, still very lengthy, while Ephron’s are almost exactly the same as in the earlier portion, coming in at 4.3 seconds. We tend to think that only high-octane action sequences are cut quickly, but today’s dialogue scenes are cut fast too. In both films, actors’ line readings are very important, but in Shop, the performances include sustained passages of body language. In You’ve Got, actors act mostly with their faces. Whereas Ephron gives us singles from the start (Kevin and Joe’s approach), Lubitsch saves his close shots for the encounter between his squabbling romantic couple. There’s an effect of gradation, with the cutting building the scene visually toward a high point, that isn’t provided by Ephron. Oddly, the modern film is less subtle than the older one. 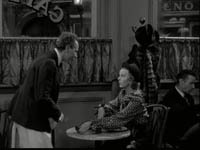 Lubitsch uses no nondiegetic music in the scene, but Ephron inserts conventionally comic music as Kevin and Joe approach and we get sorrowful music when Kathleen leaves the café in tears. Although many people think that old movies are hammy and overplayed, here it’s just the opposite. Stewart performs subtly, but Hanks, whom many take as today’s Jimmy Stewart, plays broadly, gesturing in extremis and at one point shaking the brownstone’s railing. 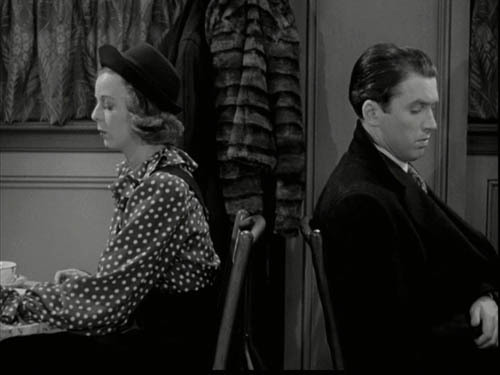 The Lubitsch scene also makes use of dramatic pauses to a greater extent than Ephron does. The redundancy is seen as well in Ephron’s reliance on cutting and singles. Nearly every line or reaction in the You’ve Got sequence gets a shot to itself. This isn’t unique to this film; every remake I’ve examined is cut faster than its original. Fast cutting, down to 2 or 3 seconds per shot on average, and a reliance on OTS’s and singles typify today’s intensified brand of continuity. Silent films were cut quite fast—in America, around five seconds per shot was common—but the arrival of sound slowed down the editing pace. The good people at Cinemetrics are building a database tracking this trend, among others. But since the 1960s, things picked up in American cinema, and today it isn’t uncommon to find films with average shot lengths of 2-4 seconds….and not just action movies. 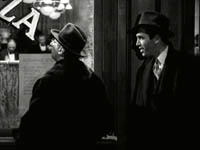 Likewise, such cutting operates in conversation scenes, making it more likely that the shots are singles rather than two-shots or ensemble framings. This “intensification” of traditional continuity tactics, I’d argue, dominates mainstream moviemaking today, and not just in the US. Such cutting can sometimes be found in the 1930s and 1940s too, but then it was one possibility within a broader range. 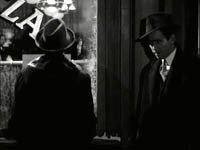 The Lubitsch example adheres to the principles of continuity editing, but it allows for more variety of camera distance and pacing. I don’t denounce intensified continuity as such; some films, most recently David Fincher’s fine Zodiac, make intelligent use of it. Still, with this as the dominant approach, the director’s range of choice has narrowed. When contemporary directors lengthen a take, it’s usually to create a virtuoso traveling shot. A simple framing like the one outside the cafe in Shop is very unusual nowadays. The sustained two shot is practically an endangered species. Why? What led to these changes between the studio era and contemporary cinema? A cynic would say that, contrary to Steven Johnson, audiences have gotten dumber and need more emphasis on character action and reaction to follow what’s going on. But in The Way Hollywood Tells It I suggest that there are many factors at work in this stylistic change. The book also provides more details of other techniques characteristic of today’s intensified continuity. (1) In particular Kristin’s Breaking the Glass Armor: Neoformalist Film Analysis, our sections of The Classical Hollywood Cinema: Film Style and Mode of Production to 1960 (written with Janet Staiger), and our Film Art: An Introduction. This entry was posted on Sunday | May 27, 2007 at 1:21 pm	and is filed under Directors: Lubitsch, FILM ART (the book), Film comments, Film technique, Film technique: Cinematography, Film technique: Editing, Film technique: Staging, Hollywood: Artistic traditions. Responses are currently closed, but you can trackback from your own site.